BOSTON—Police have nabbed the 19-year-old suspected Boston Marathon bomber, after a day-long manhunt that completely shut down the city of Boston and several suburbs and left one police officer dead. Some Bostonians flooded into the streets cheered the news, celebrating an end to five days of fear since the bombs wounded more than 175 people and killed three. An ambulance arrived at the scene to take the wounded suspect, Dzhokhar A. Tsarnaev, to a hospital. Massachusetts State Police Col. Timothy Alben said he is in serious condition. Tsarnaev was found in a boat in the yard of a home on Franklin Street, close to where he and his older brother engaged in a shootout with police nearly 24 hours earlier. The homeowner discovered Tsarnaev when he saw blood on the outside of his boat and then lifted the tarp to find a person, covered in blood, inside. Police used a heat-detecting device on a helicopter to find out that he was still inside, and exchanged gun fire with the suspect for the next hour, before he was apprehended. Watertown residents--finally able to leave their homes around 8:45 p.m.--broke into cheers and applauded police officers after word spread that the suspect was in custody. "We're so grateful to bring justice and closure to this case," Alben said at a 9:30 p.m. press conference. "We're exhausted ... but we have a victory here tonight." Boston Police Commissioner Ed Davis said he could find no explanation for the "savagery" of the attacks, but that the capture made him proud to be a Boston police officer. "We've closed an important chapter in this tragedy," President Barack Obama said in brief remarks at the White House Friday night, noting there were still many unanswered questions about the Tsarnaevs' actions. "Whatever they thought they could ultimately achieve, they failed," Obama said. Americans, he said, "refuse to be terrorized." Just a few hours earlier, at 6:00 p.m ET, police announced that the 19-year-old suspected bomber had eluded capture after fleeing from police on foot early Friday morning. Thousands of law enforcement officers conducted a nearly 24-hour door-to-door manhunt for Dzhokhar Tsarnaev, who is suspected of helping his brother plant two bombs near the finish line at Monday's Boston Marathon that wounded more than 170 people and left three dead. Officials announced at 6:00 p.m. news conference that they had been unable to apprehend the suspect, despite combing through a 20-block area of the Boston suburb of Watertown and shutting down the city's entire public transportation system in an effort to prevent him from fleeing. They said they did not know if he had a car, or if he was still on foot. The home where Tsarnaev was eventually discovered was outside the 20-block perimeter, and had not been searched. Gov. Deval Patrick lifted his previous "shelter in place," or lockdown, order for the city of Boston and many surrounding areas of the city at 6:00 p.m.. But Patrick urged Bostonians to continue to be "vigilant" as the "very dangerous" armed suspect has not been apprehended. An overnight police chase and shootout left Dzhokhar's 26-year-old brother, Tamerlan Tsarnaev dead and Dzhokhar on the lam. Federal investigators had released photos and videos of the two men hours earlier, showing them in the vicinity of the marathon finish line before the twin explosions. Dzhokhar Tsarnaev was seen placing a backpack on the ground minutes before the blast, investigators said. One MIT police officer was killed and another transit police officer seriously wounded during the violent spree. The city of Boston and its surrounding areas ground to a standstill for hours as police went door to door searching for the suspect in the suburb of Watertown. Police said they had uncovered several improvised explosive devices (IEDs) in Watertown and in the brothers' home in Cambridge. Tsarnaev is a student at the University of Massachusetts-Dartmouth. The Tsarnaev family is originally from Chechnya, a volatile and once war-torn southern Russian republic. The family fled to Kyrgyzstan and eventually immigrated to the United States as refugees about 10 years ago. Authorities gave no indication of what they might believe the brothers' motivations could have been in the crime. Tamerlan Tsarnaev, the dead suspect, studied at a local community college and was a Golden Gloves boxer. He also reportedly had a wife and young child. The FBI questioned him two years ago at the request of the Russian government, but found nothing suspicious, according to the AP. Dzhokhar Tsarnaev, who was remembered by former classmates as bright and personable, posted links to pro-Chechnyan independence sites on his social media page, and listed his "world view" as Islam. Tsarnaev appeared to be posting to his Twitter account even after the marathon attacks, writing in his last post on Wednesday, "I'm a stress free kind of guy." His posts covered everything from cute photos of his cat to rap lyrics. In an interview with The New York Times, the suspects' father said Tamerlan had been unable to become a U.S. citizen because he was arrested for hitting his girlfriend, and that he traveled to Russia last year to live for six months and renew his passport. 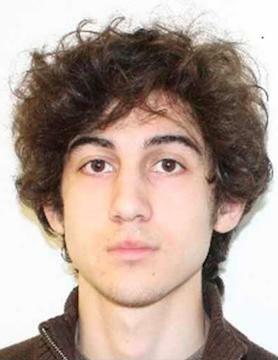 Dzhokhar is a naturalized U.S. citizen. The suspects' uncle, when told that one of his nephews was killed by the local CBS News station Friday afternoon, replied that he deserved it. Later, in an emotional press conference outside his home in Maryland, Tsarni said his nephews had brought shame upon his family, and called them "losers." He speculated that they were not "able to settle themselves" and were "angry at everyone who was able to." He said he did not believe they were motivated by radical politics in Chechnya or religion. He added that he hadn't been in touch with the family for several years but would not say why. Other family members, including an aunt and the brothers' father, said they did not believe the brothers could have planted bombs. The University of Massachusetts at Dartmouth announced shortly after 10:30 a.m. on Friday that they were evacuating the entire campus after learning Tsarnaev is a registered student there. The suspect reportedly attended a party there on Wednesday night, two days after the bombing. Earlier, at sunrise Friday, Gov. Patrick ordered a shutdown of all public transit and for residents in the city of Boston and on its edges to stay indoors. Amtrak also shut down all trains between Boston and New York. Boston and the surrounding areas of Watertown, Waltham, Belmont, Cambridge, Newton, Allston and Brighton were placed on lockdown for most of Friday. A no-fly zone was declared over Watertown. The city of Boston was eerily quiet for much of the day, the city's busy intersections totally abandoned. The mayhem began at approximately 10:20 p.m. Thursday in Cambridge when police said the bombing suspects shot and killed an MIT campus officer, Sean Collier, 26. Davis said that Collier was "assassinated" by the suspects while sitting in his cruiser. The terror suspects then carjacked a Mercedes-Benz SUV with the driver inside and fled, eventually letting the driver go unharmed. Police issued a plea on Twitter for residents of Watertown to lock their doors and not open them for anyone, as dozens of police officers, many of them off duty, searched backyards and exteriors of houses there, and a police perimeter of several blocks was established. Worried residents were also told to turn off their cell phones out of fear that they could trigger improvised explosive devices. The suspects exchanged dozens of rounds of gunfire with patrol officers, and lobbed IEDs out of their vehicle, injuring several officers. Tamerlan Tsarnaev was shot by police and brought to Beth Israel Medical Center. He arrived at the hospital under cardiac arrest with multiple gunshot wounds and blast-like injuries to his chest. The second suspect fled on foot. 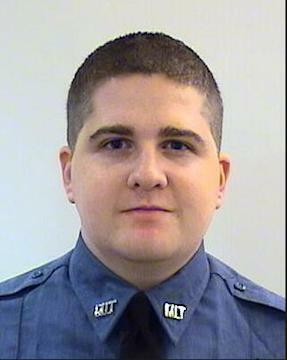 A transit police officer, Richard H. Donohue, was seriously wounded during the exchange of gunfire, officials said. K9 units and SWAT teams searched homes on Spruce Street as officers with a police robot searched an SUV that the suspects had abandoned. Multiple devices were left in the road and two handguns were recovered, according to police scanners. "We believe this to be a terrorist," said Boston Police Commissioner Ed Davis, of Tsarnaev. "We believe this to be a man who has come here to kill people. We need to get him into custody." 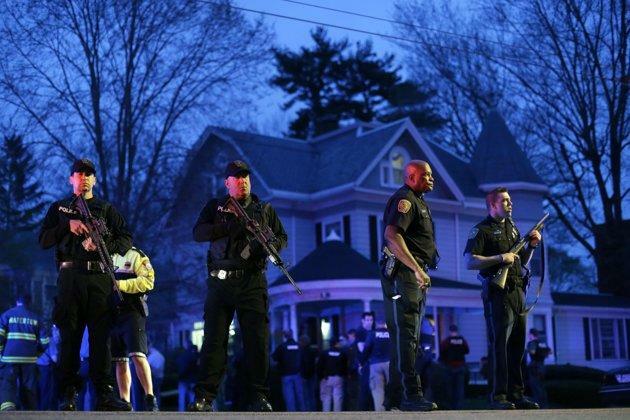 Police in Watertown, Newton, Brighton and Cambridge were put on high alert. "Units use caution," an officer said. "He might have an explosive object on his person." Police were able to track down images of the suspects after a victim of the attacks, Jeff Bauman, came to them with a description, Bloomberg reported Thursday. Bauman's legs were torn apart by the bomb. --Yahoo News reporter Dylan Stableford contributed to this report from Connecticut. Liz Goodwin is reporting from New York.